New year predictions are not something this blogger has indulged in before – but it seems to be a universal obligation for the first blog of the year. There is little to be said for it at face value: predictions are either banal continuations of current trends, or depend too heavily on events that are unpredictable. Still, they may reveal something interesting about the way the blogger sees the world- so here goes. The most important event of 2016 in British politics (and that will be my main focus) will be a referendum on UK membership of the European Union. This is not certain for 2016, but nevertheless looks more than likely. I predict a comfortable majority (in the region 60-40) for the Remain campaign – I am not joining the crowd who suggest that it will be very close, or that Leave will win. Unlike fellow Lib Dem blogger David Boyle, I don’t think the referendum campaign will be a repeat of Scotland’s independence campaign. Not because I think that the status quo supporters will be any more inspiring or less negative. There are routine calls for Remain supporters not to repeat the “mistake” of Scotland’s No campaign, which failed to make a positive case for the Union. This rather overlooks the fact that No won in Scotland, in spite of a brilliant Yes campaign. There were signs of ineptitude on the No side – but that more applies to the minor tactics, which were dictated by a Scottish Labour Party whose lack of political skill was shown to all in this year’s General Election, when they were reduced to a single seat. I expect the Remain campaign will manage things better. But the main reason why the EU referendum will not be like the Scottish one, is that their is no equivalent of the SNP-organised Yes campaign. They managed to motivate their supporters through a very positive, inclusive message, which appealed to young people. There are people in the Leave EU campaign that think that life outside the EU is a fantastic and positive opportunity for Britain, but they look very unlike the Scots Nationalists. For a start many of these are businessmen who think that leaving the EU means deregulation, so that they can screw their employees, customers and the environment even harder. They are fundamentally unconvincing when they suggest that this will make more than few people better off – there is no economic card equivalent to Scotland’s oil. But a deeper problem for the Leave side is that most of their supporters are of the stop-the-world-I-want-to-get-off type. To them the EU represents the intrusion of the modern, globalising world, and leaving it will enable the country to put up stronger barriers to the world. Especially when it comes to the free movement of people. This is a striking contrast to the Scotland Yes campaign. The Leave campaign are (mostly) convinced that immigration is their trump card – and many Remain supporters agree, and are duly worried. Most people outside London are convinced that immigration is too high and one of the main problems that Britain faces. But I don’t think this will be as easy a card to play for Leave. First I doubt whether the public quite has the courage of its convictions on the issue – on the same principle that most voters talk about how much they distrust established politicians, but then keep electing them anyway. Second, the referendum will not change Britain’s political class, and the public doubts its will to deliver lower immigration, even outside the EU. Perhaps these two points two sides of the same coin. So Remain will win. What will that do to British politics? The conventional wisdom, which I have supported, is that this will tear the Conservative Party apart. But I have changed my mind on this. Europe has been a defining issue for many Tory activists, and they will be upset that the referendum was lost. But we must remember two things about the Tories. First: their party is not “democratic”, by which I mean that its members don’t control things through electoral processes, as they do in the Lib Dems and Labour (sort of, in both cases). The controlling elite has huge power over party direction and can weather the odd storm. Second, the party has the prospect of political power before it. They are in power, and the opposition is weak; too many people, with too much money, will not want to throw away the opportunity to hang on to that power. The example of Ukip, now a chaotic, busted flush, is not encouraging to rebels. The main threat to the Tories comes from who they choose to succeed David Cameron as leader. But this is quite tightly controlled by the parliamentary party, who have an instinct for survival. No equivalent of Jeremy Corbyn is in the wings. What other predictions? Jeremy Corbyn will remain leader of Labour, and consolidate his power. Labour’s Sadiq Khan will win London’s Mayoral election. Labour “moderates” will bide their time; setting up a rival party is unrealistic on so many levels. And the Lib Dems? They will achieve some local successes, which will be enough to convince insiders that they are making a comeback, but nobody else. The SNP dominance of Scotland will continue in the Scottish parliamentary elections, but I will be surprised if the Conservatives manage to overtake Labour. And the economy? I think that trouble will strike before 2020; the economy looks too much like its old self in the days of Blair and Brown. How will it come about? Britain is vulnerable to events elsewhere in the global economy. Perhaps foreigners will start pulling out of the London property market, causing developers to get into trouble, and then whoever is lending them money. This could spark off a long term decline on Britain’s property values, quite opposite to the conventional wisdom that prices are driven by excessive demand, rather than excessive finance. And yes, that process could start in 2016. What about elsewhere in the world? Perhaps 2016 will produce an unexpected drama in the US elections, but I expect the winner to be a Democrat. Hillary Clinton looks a shoo-in, but could she be derailed by something in her back history? And Syria? The civil war looks like a stalemate until Saudi Arabia and Iran decide that they need a rapprochement. Continued low oil prices could force that. A coup within Islamic State to produce a new regime that seeks alliances with other actors should not be ruled out. – and less sponsorship of outside terrorism. But terrorism will go on. Of course the last three paragraphs have enough escape clauses to not count as serious predictions. But that will have to do for now! Two-party politics is making a come-back even if people don’t want it. There is now less than a week to go before Britain’s General Election (Thursday 7 May).The tension mounts amongst those that follow these things. So far the opinion polls swing this way and that, but on average remain nearly static. In the BBC Poll of Polls the parties haven’t wavered more than 1% from 34% each for Conservatives and Labour, 14% for Ukip, 8% for the Liberal Democrats and 5% for the Greens. But things could change significantly in the last week. Much of the important movement remains invisible. It is in 100 or so competitive seats (I’m excluding Scotland from my commentary for now). Significant movements here do not show in the polls. The Conservative and Labour parties, easily the best resourced, are cranking their campaigns up a gear. And their main targets are voters who are supporting the smaller parties: the Lib Dems, Ukip and the Greens, and no doubt Plaid Cymru too in Wales. In Labour-Tory marginals these voters are relentlessly being told that a vote for their preferred party is wasted: the real choice is between the big boys: and you don’t want the other side to win, do you? In seats where these other parties are in contention (and especially the 46 English and Welsh seats held by the Liberal Democrats) the effort is no less relentless. The Conservative leader led an attack on the Lib Dem seats in the southwest this week; Labour are no less determined to capture seats from the Lib Dems. The single Green seat of Brighton is under fierce attack by Labour. There is a massive battle in seats such as Thanet South where Ukip are in contention. The smaller parties’ voters seem a softer target than trying to pick off voters directly from the other main party. We don’t know how successful this push by the big parties will be. But the Lib Dems are widely expected to lose over 30 of their 57 seats; the Greens could lose their only seat; Ukip might be left only with their by-election win of Clacton South. Of course I hope that the Lib Dems will do better than that (and more than hope – I will be stepping up my personal contribution to their efforts). But there is a strong prospect that the two big parties will win all but 25 of the 573 seats up for grabs in England and Wales. Two-party politics will have triumphed, even if the other parties win a more likely 35. That is worth a little reflection. The conventional wisdom has been that two-party politics is over, The major parties cannot to get beyond 68% of the total vote between them (it used to be in the 90s). The BBC election logos show many colours; we had our first seven-way party leaders’ debate on the television. But once the results are in, you can bet that this will be tossed aside. There will be no real pressure for electoral reform, and the normal service will resume. Insiders in the main parties, the media and the civil service will heave a sigh of relief. The interval of coalition government involving the Liberal Democrats will be just a bad dream. Except of course there is Scotland. This has been bit of a one-party system, with Labour dominating parliamentary seats. It still looks like being one-party system – but this time with the SNP in charge. Their success may well mean that the two big parties still cannot dominate the UK parliament as they once did. But that only goes to emphasise just how much the country’s electoral system dominates politics. It is a winner-takes-all system, where the aim is to destroy your opponent, not to promote your positive values. The electoral reform proposed in 2011, the Alternative Vote, probably wouldn’t have changed this. The parliament may be very unrepresentative. Many supporters of other parties may feel disenfranchised. But the people in the system just don’t care. All they think about is the potential prize of winning big and the vast bonanza of power and patronage that can bring. And to win big your party doesn’t have to be popular: you can do so if the other party is weak. And there always tempting fissures to exploit. In the self-view of the main party supporters (including the SNP in this case), there is no particular problem about this. They haven’t really accepted the right of other parties to exist. In yesterday’s Question Time show the Labour leader Ed Miliband thought it was fine to suggest he would try to implement the Labour election manifesto unmodified whether or not he had a full electoral mandate. He seemed to have no notion that this might be undemocratic. When the Liberal Democrats joined the Conservatives in coalition this was seen as treachery by Labour supporters. The major parties would prefer a one-party state best of all – a situation they have sometimes achieved at local level. To them this would simply be a natural affirmation that they are in the right. They may concede that the world has to be divided into tribes of left and right but that is as far as they will go (though for the SNP haven’t got beyond the one-party state idea). Since these are the people who control what happens in our political system, is there any chance it will change? Should it change? This will be among the big questions we English (and the Welsh) will need to face after the election. About a third of people vote for parties other than the big two. This would surely be more if the pressure to vote for one of the big two wasn’t so great. Politicians’ standing in the public eye is not high. This should be a good moment to promote electoral and other political reform. It could happen: it did in New Zealand in 1996. But to do so the Labour and Conservative parties have to come under existential threat – the sort of threat of implosion that both have suffered in turn in Scotland. This is possible. If Labour end up in government, as still seems most likely, they will be riven by divisions and disappointed expectations. The Conservatives could be fatally divided by their attitudes to Europe. Personally I think that the Liberal Democrats should put political reform at the heart of their agenda after the election. It used to under Paddy Ashdown in the 1990s, but subsequent leaders diluted it. They then need to assemble a coalition for reform, perhaps linking up with the Greens (though Ukip might be a step too far!) – and any splinters that the other parties might produce. But the battle will be an uphill one. The party has its own tendency to the winner-takes-all idea. But at 8% in the polls and its former electoral strategy in ruins, some fresh thinking is called for. Posted on May 1, 2015 Author MatthewCategories Politics UKTags 2015 Election, Conservatives, Labour, Liberal Democrats, SNP2 Comments on Two-party politics is making a come-back even if people don’t want it. British election: tactics have triumphed over strategy. The result is deadlock and danger. 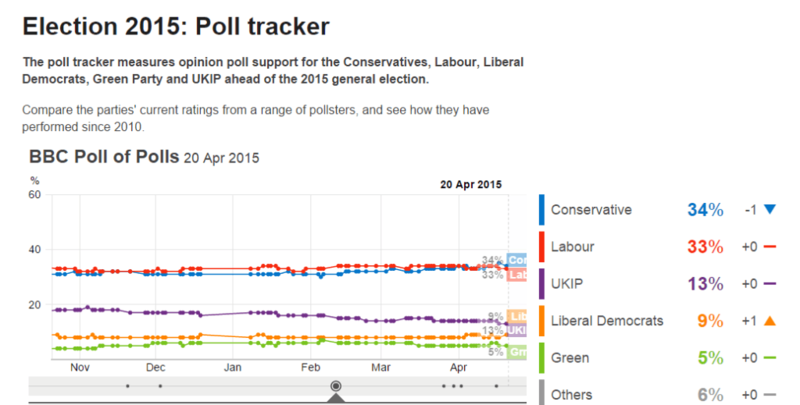 To make sense of the opinion polls in Britain’s general election it is best to look at the BBC poll of polls. There just isn’t much going on. When each poll comes out there is a breathless headline, as the votes seem to shift from the last time the poll was taken – and this is usually expressed in terms of the gap between the top two parties. For example yesterday the Ashcroft poll showed a 4% Conservative lead rising from zero the previous time; and ICM showed the Conservative lead dropping by 2% to 2%. But all that is happening is random variation around something quite stable: Conservatives and Labour both on 34%; Ukip on 14%; the Lib Dems on 8%; and the Greens on 5%. Perhaps the Conservatives and Lib Dems have edged up slightly at the expense of Labour and Ukip in the last few days – but it is too early to tell. The big picture is remarkable stability. The Conservatives seem to be the most perplexed by this. The party had a plan, the best possible professional advice, carefully tested on samples of voters, and everything had been working well. Good economic statistics have been coming out each week; they easily outmanoeuvred Labour in the Budget; the press mobilised and they have plenty of money. But they are stuck. Their plan was to scare voters with the prospect of a Labour victory, both by demonising Labour’s leader Ed Miliband, and raising the prospect of higher tax or borrowing under Labour. Against the minor parties luring voters away, they created the phrase “coalition of chaos” to tap into general scepticism that coalitions mean broken promises. With this, they had clearly calculated, they could bring in an election winning score, with the upper 30s in poll ratings and a lead over Labour of 6% or more. This was more about hauling voters in from Ukip and the Lib Dems, and abstainers, than actually converting Labour voters from 2010. But the Tory approach to this election has proved to be all tactics and no strategy. Those professional advisers call themselves “strategists”, but they their brains carry no strategic thoughts. This is how the modern political class thinks: and so they are blaming failure on poor tactics. Much has been made of Mr Miliband doing well on television and so exceeding the low expectations. There is some evidence for this (his ratings seem to be a bit less dismal). But his performances cringe-worthy as ever – full of abstract ideas and only token connection with real people. The real problem is that the Tories are fighting against two very damaged brands. First their own, as the “nasty party”, on the side of the rich. Second the general brand of mainstream politicians as slippery so-and-sos out for themselves. And their problem is that strategically the party has gone backwards in the last five years. No clever tactics can cover for that. Things had been picking up for the Conservatives when David Cameron took over in 2005. He worked hard to detoxify the Tory brand by associating it with softer policies and softer images. This had been working very well until shaken by the twin shocks of economic crisis and the MPs expenses scandal. Still, going into coalition with the Liberal Democrats in 2010 was an excellent strategic move. It gave substance to the detoxification process. But thereafter it collapsed. It turned out that detoxification was a tactic for the 2010 election, not a strategy. Out came all the vile Tory instincts: obsessive anti-Europeanism; bashing the disadvantaged; scepticism of environmental policies; and so on. This was mainly driven by the party’s backbenchers – but Mr Cameron lifted not a finger to stop it. A low point came in 2011 with the party’s campaign against implementing the Alternative Vote (AV) electoral system, when they not only deployed a series of spurious arguments, but they launched a particularly nasty attack on the Lib Dem leader, Nick Clegg. Funnily enough, supporting AV would have been a good strategic move for the Tories – as this system tends to reinforce two party politics; advantages to the Lib Dems would have been short-lived. Since then the Tories have compounded their strategic errors – notably by neglecting Scotland and stirring up English suspicions of the Scottish. I will allow Mr Cameron credit for two positive strategic moves: support for gay marriage (which has helped detoxify the brand amongst gays, in spite of interanl opposition within the party) and the renegotiate-and-referendum policy on Europe. The latter is often viewed as a tactical concession to Ukip pressure – but there is real strategic value for the Conservatives in it – though a referendum campaign could kill the party, it is often strategically necessary to embrace risk. Labour are no better. Their “strategists” conjured up a cunning tactical plan to win them the 2015 election: the 35% strategy. The idea was not so much compete to for the Conservative vote, but to hang on to their core vote and scoop up a large chunk of the ex-Lib Dem vote. This equates roughly to 35%, and would ordinarily be enough to win under the country’s electoral system, if the Tories remain undermined by Ukip. 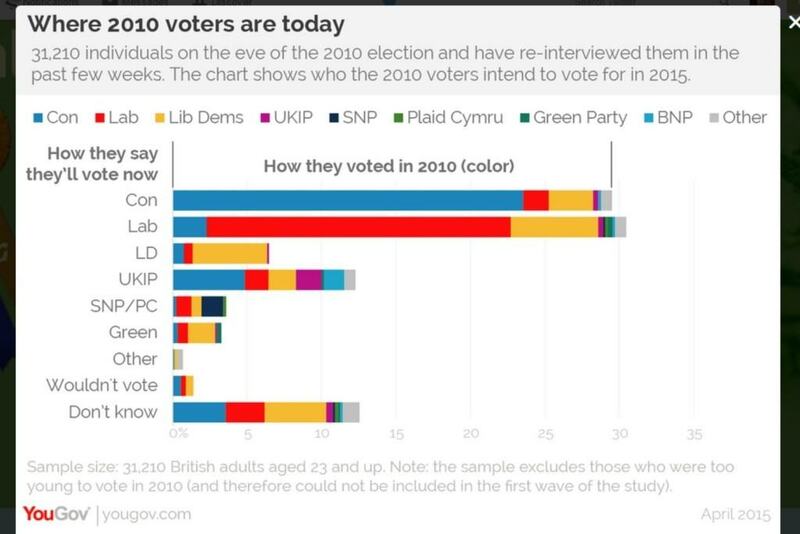 This fantastic graphic from YouGov shows that this has largely been working (hat-tip Mike Smithson of Political Betting, on of the best places to go for objective news on polling). Labour have been boosted by a large slug of ex-Lib Dem votes (though the Greens have scooped up a lot of these too – I suspect this is mainly in safe Labour seats). Meanwhile a large slug of the Tory vote has gone to Ukip. Of course there’s a major flaw in Labour’s plan. Scotland. Labour’s relentless focus on political tactics rather than strategy meant that they didn’t see the SNP juggernaut approaching, in spite of its clear visibility ever since the Scottish assembly elections of 2011. It looks likely that the SNP will sweep Labour out of Scotland, along with the Lib Dems. Labour weren’t ready for this, and have had no effective tactics for handling it. They wasted a lot of energy on trying to tell their voters that a vote for the SNP would let the Tories in. The SNP have had little trouble in torpedoing this notion. And this is the sort of thing that happens if you systematically neglect strategy, and focus on short-term advantage. You are vulnerable not just to getting stuck in a rut, like the Tories, but to sudden collapses in support. Look at the Lib Dems. The party had been relentlessly tactical in building its support base, especially under the watch of Charles Kennedy, its leader from 1999 to 2006. Nick Clegg, the current leader (since 2007), is more strategic but could not undo the party’s vulnerability; he completely misread the danger from promising not to raise student tuition fees in particular. The result was that the party’s support collapsed as soon as they entered coalition with the Conservatives – even though this was a correct strategic decision. It was viewed as betrayal by many of the party’s voters and the party’s brand has been badly damaged. Though it is saying many sensible things in the campaign, and much that a lot of people would agree with, most people just aren’t listening – and its new pledges invite a sceptical response. It now relies on popular candidates to maintain its place in parliament. The party has some hard strategic choices to make after the election. The only party that looks truly strategic is the SNP. They have had an easy hand to play, admittedly – simply to exploit the neglect of Scotland by Britain’s political class. But you can see them thinking two moves or more ahead all the time, allowing them to capitalise on their gains. They are now executing a tricky manoeuvre from the political right to the left without incurring any real damage. But for Britain’s main parties strategy is much harder. To gain strategic advantage they have to sacrifice tactical benefits, and to take tactical risks. They need to address the generally bad reputation of politicians by being less negative and less aggressive towards their opponents; they need to embrace political reforms (on party funding and electoral systems) that may cause them short-term setbacks; they need to have open rows within their own ranks about what their parties stand for. For the Tories it looked as if Mr Cameron might embrace this agenda, but he lacked the courage. For Labour, David Miliband might have done so, but the party opted for his younger brother. The highly professionalised and tactical focus of Britain’s political class has led to the current electoral impasse. After the election it could lead to the breakup of the Union and the country’s departure from the EU. Does the country’s political class understand the danger it is in? Will the right leaders emerge to make the difficult political decisions needed? I’m not counting on it. These are exciting times in British politics. The two party system, dominated by the Conservative and Labour parties for s long, is under threat as never before. Other parties are increasing their share of the vote. But the electoral system will mostly shut them out of parliamentary representation. The real threat to the big parties is that they will fragment. This looks increasingly likely after the General Election in May. Both main parties are in fact coalitions covering a wide spectrum of political values. This is forced by the electoral system, but a tribal, class-based loyalty provides stability. But class identities in British society are slowly ebbing. Increasingly people support political parties because of their political values, and not tribalism. The initial threat to the two parties came from the Liberal Democrats, whose appeal was largely in the middle ground. This direction of attack proved electorally successful, but the party was unable to build a solid bedrock of support. Entering coalition government in 2010 caused their support to evaporate. Conservative and Labour politicians gloated, hoping for a return to two-party normality. Alas for them, new insurgent parties are proving a much deeper threat. First came the UK Independence Party, with its appeal to the populist right. This was a direct attack on the Tory bedrock. It has forced that party to tack hard to the right, especially putting Britain’s membership of the EU in play. The party’s more liberal and internationalist wing is under attack, as the party gradually ceases to look like a credible party of government. Ukip threatens Labour too, but the threat is less immediate. The Labour leadership seemed to be successful in holding a moderately liberal line. The Greens are another source of threat. They are appealing to the hard left, with a tack away from their environmentalist core towards anti-capitalist ranting. But they are at once too anarchistic and too ideological to have a very broad appeal. They may be scooping up some of the disaffected Lib Dems that Labour was counting on. But they don’t look an immediate threat to Labour. It is highly unlikely that they will do much more electorally than hold onto their single parliamentary seat. It is the Scottish National Party that is proving to be Labour’s existential threat. In Scotland they have used the independence referendum to launch an attack on the Westminster parliament. Labour had long since treated this as an unchallengeable fiefdom. They seem to have no idea how to fight a competitive election in Scotland. Polling consistently shows that they are facing meltdown there, with the SNP on course to win the bulk of Scottish seats. Unlike Ukip and the Greens, the SNP are a cunning opponent. They have positioned themselves to the left of Labour, with firm opposition to austerity economics and nuclear weapons. They suggest that they could come into coalition with English and Welsh Labourites, and the result would be more left wing than Labour on its own. Labour’s counter argument that the SNP might let the Tories in is a clear nonsense. They only way that happens is if Labour themselves prop up a Tory government. If the SNP and Labour have a majority between them, they can keep the Tories out. Labour are struggling to come up with a stronger line of argument. But the SNP threat is changing the balance south of the Scottish border. Many English leftists rather like the look of the SNP, and they are talking positively about the idea of a Labour/SNP coalition. Scottish Labour supporters must feel like the first wave of soldiers that have jumped out of the trenches and into enemy fire, who look behind them so see the second wave heading for the rear. English Labourites have written them off and are talking up their mortal enemies. This poses a serious problem for the Labour leadership. Firstly the party line on austerity economics and nuclear weapons is critical to holding their internal coalition together, and to its wider electoral appeal. Rightly or wrongly they are seen as part of the essential core of a credible British government. If they cave in, then they expect to be condemned to life as a left wing fringe, and all the power and status which comes of being a major party starts to melt away. And yet their most vigorous activists, and their union donors, will be highly sympathetic the SNP demands. And then there is an even bigger problem. What will all this do to the party’s appeal to English voters? The idea of a Labour prime minister being propped up by the SNP would surely be lethal, especially if Labour had fewer seats than the Tories. English nationalism would rise to the benefit of both the Conservatives and Ukip. The Tories have already brought the idea into their campaign literature. Labour could be right that support for the SNP will increase the chances of a Tory government – but because of how it will play in England, not Scotland. The leftists who are cultivating the idea of a Labour-SNP partnership are astonishingly naive. The SNP’s goal is to fracture the union by driving a wedge between Scotland and England. Such a fracture will not suit the left’s interests – the left has long since lost its grip on the English middle ground, and is clueless about how to win it back (they demonise the last politician to achieve that for them: Tony Blair). The SNP may not be able to obtain a second referendum on independence this parliament, but that is hardly the point. They have a strategic plan and the left doesn’t. The left needs to create a strong unionist political platform that does well north of the border. If they give up on that, they are lost. But the Labour leadership, not just the current one, but its predecessors, have done much to create the problem. They have viewed the UK constitution purely through the lens of short-term political advantage. They have suppressed serious discussion of the role of Scottish MPs on English politics. Now it is not just too late, but they have no vision with which to fight back against the looming disaster. The Labour Party is a tribal affair, with a vicious, partisan face that seeks to crush any idea of political plurality outside their own movement. I will not be sorry to see it collapse. But progressive politicians need to start thinking about how to forge a new political movement.